The patella is a small bone located in front of your knee joint — where the thighbone (femur) and shinbone (tibia) meet. It protects your knee and connects the muscles in the front of your thigh to your tibia. 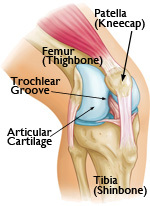 The patella rests in a groove on top of the femur called the trochlear groove. When you bend and straighten your knee, the patella moves back and forth inside the groove. The ends of the femur, trochlear groove, and the undersides of the patella are covered with a slippery substance called articular cartilage. This helps the bones glide smoothly along each other as you move your leg. Patellofemoral arthritis occurs when the articular cartilage along the trochlear groove and on the underside of the patella wears down and becomes inflamed. When cartilage wears away, it becomes frayed, and when the wear is severe, the underlying bone may become exposed. Moving the bones along this rough surface is painful. Patellar (kneecap) fractures often damage the articular cartilage that covers and protects the underside of the bone. Even though the broken bone heals, the joint surface may no longer be smooth. 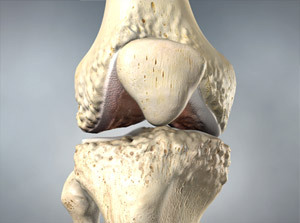 There is friction when the patella moves against the joint surface of the femur. Over time, this can lead to arthritis. Dysplasia occurs when the patella does not fit properly in the trochlear groove of the femur. Because of this, when the knee moves, there are increased stresses on the cartilage. This begins to wear the cartilage down. The main symptom of patellofemoral arthritis is pain. Because the patellofemoral joint is in front of the knee, you may have pain in this area. The pain can be present at rest or with no activity at all. Most of the time, however, it is brought on by activities which put pressure on the kneecap, such as kneeling, squatting, climbing stairs, and getting up from a low chair. In addition, you may experience a crackling sensation called crepitus when you move your knee. Crepitus is sometimes painful and can be loud enough for other people to hear. When the disease is advanced, your kneecap may get stuck or “catch” when you straighten your knee. Non-steroidal anti-inflammatory medication. Drugs like aspirin, naproxen, and ibuprofen reduce both pain and swelling. Exercise. Regular exercise can decrease stiffness and strengthen the muscles that support your knee. Patients who have patellofemoral arthritis should try to avoid activities that put stress on the front of the knee, such as squatting. If you regularly do high-impact exercise, switching to low-impact activities will put less stress on your knee. Walking and swimming are good low-impact options. Activity modification. In many cases, avoiding activities that bring on symptoms — such as climbing stairs — will help relieve pain. Weight loss. If you are overweight, losing just a few pounds can make a big difference in the amount of stress you place on your knee. Losing weight can also make it easier to move and maintain independence. Physical therapy. Specific exercises can improve range-of-motion in your knee. Exercises to strengthen the quadriceps muscles will help relieve pressure on the kneecap when you straighten your leg. If an exercise causes pain, stop the exercise and talk to your doctor or physical therapist. Cortisone (steroid) injections. Cortisone is a powerful anti-inflammatory medicine that can be injected directly into your knee. Viscosupplementation. This involves injecting substances into the joint to improve the quality of the joint fluid. Surgery is an option when nonoperative treatment has failed. Several types of surgical procedures are available. Chondroplasty. This procedure is done with arthroscopy — inserting thin surgical instruments in small incisions around your knee. During a chondroplasty, your surgeon trims and smooths roughened arthritic joint surfaces. Chondroplasty is an option in cases of mild to moderate cartilage wear. Realignment. The soft tissues on either side of the kneecap are tightened or released to change the position of the kneecap in the trochlear groove. Cartilage grafting. Normal healthy cartilage tissue may be taken from another part of the knee or from a tissue bank to fill a hole in the articular cartilage. This procedure is typically considered only for younger patients who have small areas of cartilage damage. Tibial tuberosity transfer. This procedure can help relieve pain in patients with arthritis in specific portions of the patella. 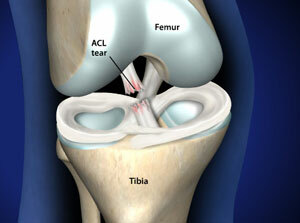 The patellar tendon below the kneecap attaches to a bump on the front of the knee called the tibial tuberosity. Shifting the bump in any direction will change, the position of the kneecap. After the procedure, the patella should move more smoothly in the trochlear groove, reducing pressure on the arthritis areas and relieving pain. Patellofemoral replacement. During this “partial” knee replacement,worn down bone and cartilage surfaces are removed and replaced with metal and polyethylene (plastic) implants. The trochlear groove is covered by a thin metallic shield and a dome-like plastic implant is used on the patella. Both components are held in place by bone cement. Patellofemoral replacement surgery cannot be carried out if there is arthritis involving other parts of the knee. If this is the case, your doctor may recommend a total knee replacement.